Barnhart is a very good lecturer, lively, interesting, informative. He has a self-deprecating humor about areas where he disagrees with his colleagues, and is respectful when talking about others' ideas that he is not wholly convinced of. 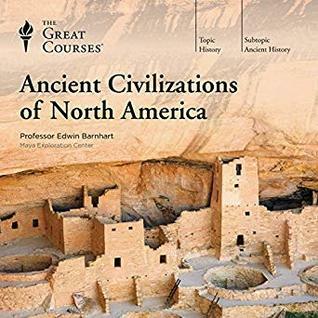 This is an absolutely engrossing tour of pre-European North America, from what we've been able to learn of the earliest arrivals, to the nations and ways of life that existed when Europeans reached the various parts of North America. Farmers, astronomers, urban planners, engineers, all created great works only some of which survive even as ruins today. I'd have loved to see more in-depth discussion of the bio-engineering of maize (corn) out of far less useful plants, or of the Iroquois Confederation, its formation, growth, and influence on the design of the US Constitution, but this is not that book. This is a tour, a survey, an introduction, and it's a fascinating one. The points on which you want to go chase down more information may be different from mine, but you will have them.